We had heard that Dunmaglas (ranked as the #1 Public Course in Michigan in 1997 and 1998 by Golf Digest) is one of Northern Michigan's most challenging golf experiences, and we finally got the opportunity to experience it for ourselves. Driving south down Burgess Road from US 31, one can get an idea of the type of terrain golfers will encounter on this course. It is extremely undulating, with significant elevation changes from tee to green. In fact, there is hardly a flat spot on the course - which is designed in an extremely beautiful and tranquil setting with no residential development intruding upon the layout. Dunmaglas does provide lodging onsite at The Cottages at Dunmaglas. 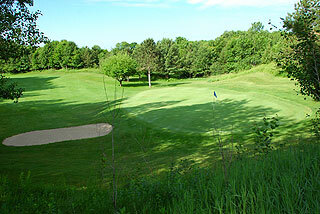 To make reservations you can contact the course at (231)547-GOLF - or click here for a link to their Lodging & Packages page. 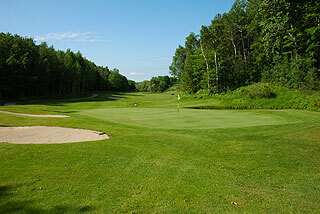 Hitting the correct portions of the twists and turns while keeping the ball in play along fairways defined by mature forests of hardwoods and pines, is the challenge at Dunmaglas. 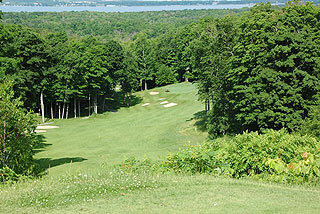 Tee shots and approaches are played downhill or uphill, requiring accurate adjustments in club selection. Bunkers are placed strategically along the fairways and also greenside, protecting medium sized putting surfaces that are at times extremely undulating with tiers and ridges. On some holes grass walls also front the greens. Golfers will have to utilize every club in their bag, with a good variety of short game skills necessary to procure a good score here. 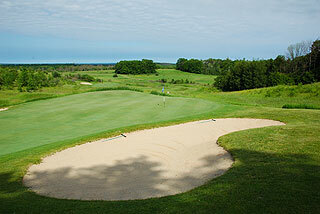 The opening hole is a good barometer of what golfers will find throughout the layout. From an elevated tee players need to locate a safe landing area along a sloping fairway bound by a creek that runs the length of the hole on the left side. Water comes into play on just 4 holes - including 3 of the last 4 - but such hazards are not missed aesthetically or strategically on such a beautiful and challenging course. High grasses, mounding, sand bunkers, plus sloping greens and fairways that result in many uneven lies make this a good day's work. Hilly is not the correct word here - this is mountain golf! The course is marked with color coded stakes located at the 100, 150 and 200 yard areas, plus sprinkler heads that are measured to the center of the green. Color coded flags indicate front, middle and back pin placement - which is of importance on these undulating putting surfaces. Golfers can choose from 5 sets of tees with yardages and slopes that measure 6901/139, 6493/131, 6104/126, 5393/123 and 5175 yards with a 123 slope from the forward tees. From our experience, it seems these ratings are a bit soft...you will need a strong attention span to score your handicap here. 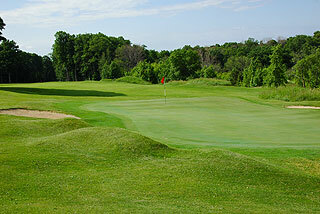 The facilities include a grass range, short game area with bunker, and large putting green. 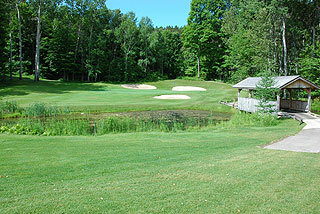 The clubhouse is simple - with a small pro shop and clubhouse that serves cold sandwiches and beverages. As the photos indicate, this is a beautiful golfing environment. 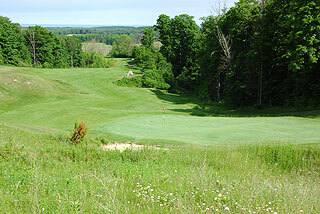 Players who cherish elevation changes and mountain golf conditions will be at home here. 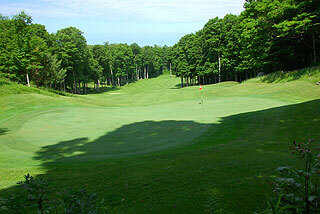 Not scoring well...just enjoy the secluded Northern Michigan environment, and the ride on the roller coaster terrain. For more info, visit our page for Dunmaglas, with direct link to their website by clicking here.